Clamorous all about noise, din and commotion. One just feels that one needs to shut one’s ears to all this noise. The decibel levels can be really high in clamorous gatherings. Just imagine yourself surrounded by complete din. What would you? I guess a pair of the best ear plugs in the world. That is how we learn clamorous: by its connection with ear plugs. Vociferous suggests that there is noisy outcry, such as that of a vehement protest: vociferous complaints. 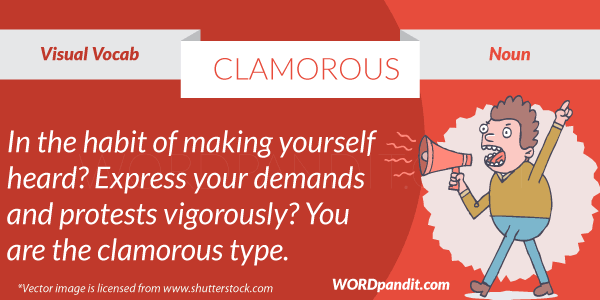 Whereas something clamorous is both vociferous and sustained: a clamorous uproar. Situation in ^ clam on us ^ ..